What is the CHAR Function? The CHAR function is categorized under the Text Function. It returns a character specified by a number. As a financial analystFinancial Analyst Job DescriptionSee a real Financial Analyst Job Description including all the skills, experience, and education required to be the successful candidate for the job. Perform financial forecasting, reporting, and operational metrics tracking, analyze financial data, create financial models, the CHAR function is useful in coding page numbers received from other files into characters or when we wish to insert a line break into text. Number (required argument) – It is the number between 1 and 255 specifying which character we want. The character is from the character set used by our computer. The character set may vary across different operating systems and so, for a specific number, the function may return different results on different computers. Windows OS uses the ANSI character set, whereas Macintosh uses the Macintosh character set. How to use CHAR Function in Excel? 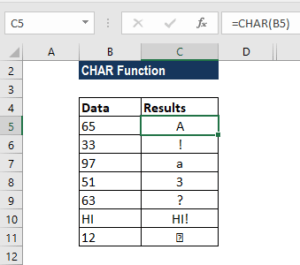 The CHAR function is a built-in function and can be used as a worksheet function in Excel. 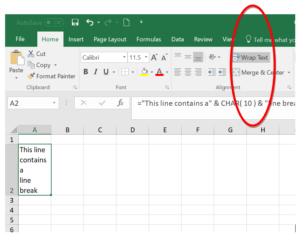 As a worksheet function, the CHAR function can be entered as part of a formula in a cell of a worksheet. If we are using this function by providing a reference to a cell, then it should not be in inverted commas. The above results are from the ANSI character set (used on the Windows operating system). a. The given argument is not an integer between 1 to 255.
b. If the argument entered is zero. 2. The CHAR function will give the result as a string/text value. 3. It was introduced in Excel 2000 version and is available in all versions after that. 4. The CHAR function is the inverse of the CODE function. 5. Excel functions CHAR and UNICHAR will return the character for a given code whereas Excel functions CODE and UNICODE would do the opposite – give the code for a given character. 6. The CHAR function is also available in VBA. 7. For numbers greater than 255, we can use the UNICHAR function.